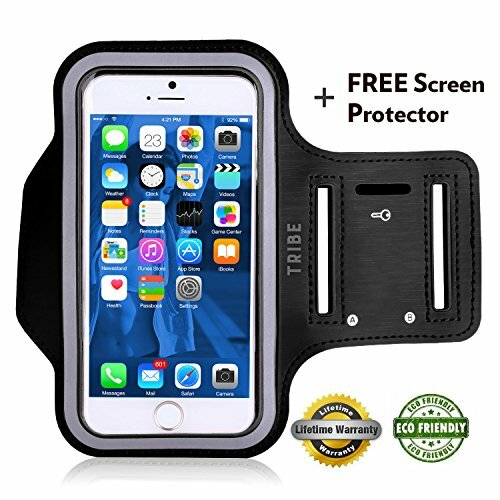 NOTE THAT THIS ARMBAND IS TOO SMALL FOR THE LARGER IPHONE 6 PLUS (5.5″). If you’ve ever been out running and tried to listen to music or send a quick text while taking a breather, you know its almost impossible to use your phone without covering it with sweat or worse dropping it along the way! Now with this armband you can safely interact with your touch screen and listen to your favorite music. ★ Compatibility and Use Use your armband with the new iPhone 6 (4.7″) also the, 5s, 5, 5c. ALSO will work beautifully with the Samsung Galaxy S2, S3, and S4. ★ You can wear it over your biceps or on your forearm. The night reflector provides additional visibility for outdoor early morning and evening runs. There is even a slot for your house key which we all know can be a lifesaver. This armband is also great for high intensity workouts, yoga or even casual walking or outdoor activities. Precision and Protection The touchscreen is fully accessible through the plastic cover. 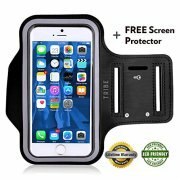 The armband pouch and cover keeps your phone safe from impact and moisture while working out. Size This armband is lightweight and accommodates arm sizes from approx. 8 to 16 inches. Also we recommend that you use this armband without a case. Material and Care Made of all Eco-Friendly materials, ie. nylon, velcro and neoprene materials. This armband can be safely hand washed and air dried after use. We do NOT recommend machine washing your armband as this could cause damage.